Taylah is up at the crack of dawn, driving you to work or school or as you hit snooze just one more time, every weekday between 6 and 9am on Breakfast! Living off green tea and good yarns, she hosts a slew of regular segments with rotating guests in every morning. Taylah comes to the station as a longtime volunteer, having presented a number of shows across the station – most notably Wednesday Drivetime. She was also instrumental in creating our current Saturday Breakfast program, Get Up Morning. She’s also worked in news and current affair for West Coast Radio in Mandurah, and has also been a news reader at both 92.9, 94.5 and Curtin FM. 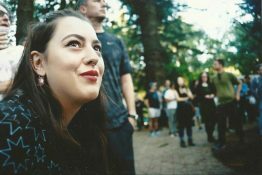 Taylah started as a volunteer at RTRFM as both a presenter, news reader, news director and volunteer at the station’s numerous events.